I think we all deserve a round of applause because we finally made it through the most boring Bachelorette season of all time. It was grueling, it was bleak, and at times we couldn’t see the way out, but today we can say we are survivors. And now, we’ve moved on to the drunkest best entry in The Bachelor franchise, Bachelor in Paradise. Get ready for makeup-melting heat, bathing suits so tiny not even the labia are left to the imagination, and Wells’ heavy pour. I hope ABC has their lawyers on call! And of course, in a shocking turn of events no one but Bekah M. saw coming, the first storyline of the season is a reunion between Tia and Colton. Unfortunately, when Tia first showed up I decided to make a little drinking game out of it. I took a shot every time someone said the name Colton. And now I’m dead and writing you from beyond the grave. But at least I never have to hear the name Colton again! So, even though it was pretty clear from the fact that Colton never contacted Tia in between seasons, straight-up told all of America that he DID NOT LIKE HER, and brushed her off when he first got to Paradise, she persisted. So Colton and his overactive sweat glands ultimately decided to take Tia on a date because the producers threatened him he wanted to see if there was still something there. And now they are all over each other on social media. Is this to convince us that they are finally a thing? Personally, I think it’s all a game to keep people talking about them. Because I’m not sure why else they must continue to torment me like this. Let’s get to the bottom of it! So you agree, then? You think you’re like, really crazy? Of course Colton commented the dumbest thing humanly possible. And at first I was going to blame this comment on what I can only assume was a career filled with concussions that have turned his brain into scrambled eggs, but then I realized it’s actually genius. Here’s why. He commented, which will obviously get Tia excited. BUT his comment is kind of rude and will make her doubt herself and her outfit. It’s the ultimate douchey comment. It make her just insecure enough that she’ll never leave you. And y’all think he’s cute just cause he likes dogs. 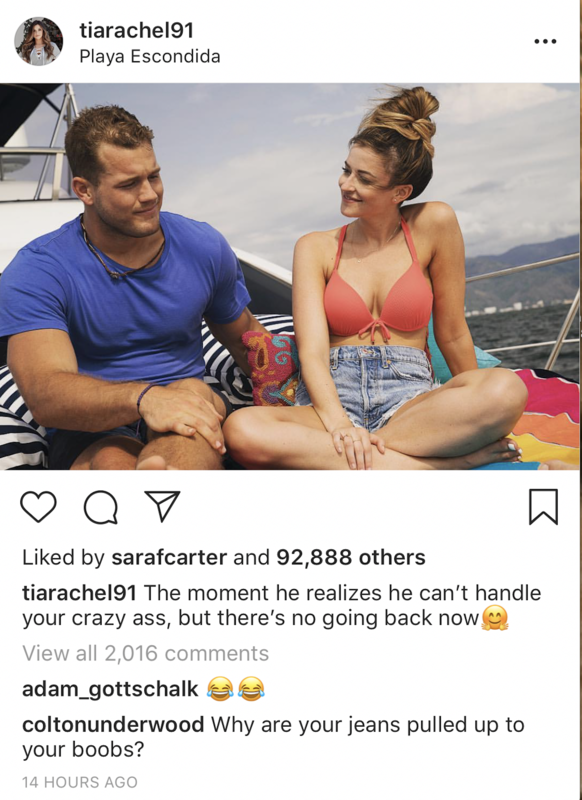 Tia couldn’t let the chance to comment pass her by. Yes, great idea Tia, let’s build up the classically handsome football player’s ego even more by saying you’re “honored” to be on his IG. Do I detect a hint of sarcasm, though? Perhaps those words say that she’s honored but mean that she wishes she drowned him on this date. Just a guess. BUT WAIT. The plot thickens! Colton took his f*ckboyery to Twitter, where he proceeded to play mind games in 280 characters or less. That Colton sure is a sweetheart! At least now Tia will have something solid to print out and bring to her therapist as evidence of why she had a mental breakdown. Honestly this is all just a scam because Colton is also flirting with Kendall. Romance isn’t dead! For the record, I don’t think Colton’s that into Kendall either. We all know this is just a mindf*ck because Colton is campaigning to be the next Bachelor. Colton’s obviously just practicing flirting with multiple women at one time. Too bad he must have missed Dean’s excursion on Paradise, where it became clear that f*cking over multiple women will not make you the Bachelor! 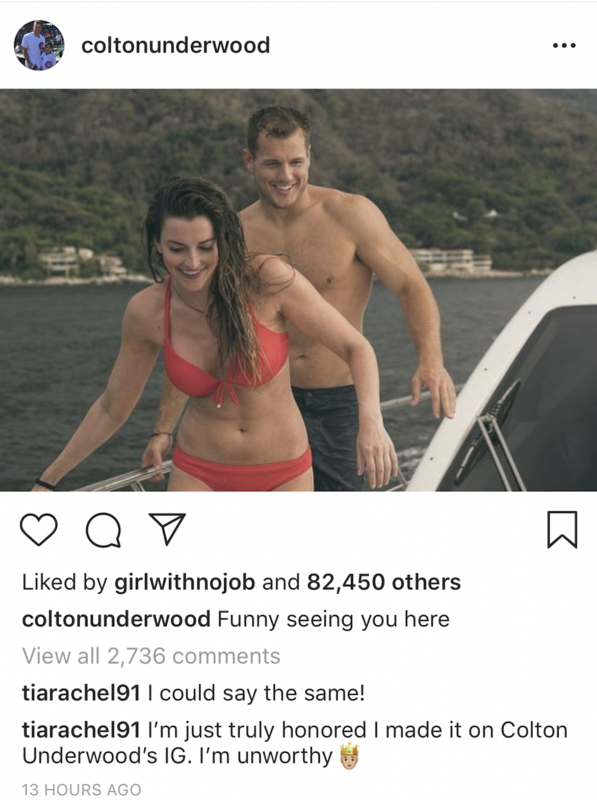 In conclusion, I don’t actually think Tia and Colton are all over each other on social to be intentionally extra. I think they actually really hate each other. Like, wish-the-other-would-sustain-burns-on-90%-of-their-bodies-and-then-step-on-Legos-barefoot kind of hate each other. So with all their commenting they’re able to take subtle digs at each other while also getting idiots like me to continue writing about them. Happy now, assholes?